It has been argued that the quality of daily interactions within organisations effects the wellbeing of both individuals and the broader organisation. Coaching for leadership development is one intervention often used to create organisation-wide changes in culture and wellbeing. Leadership style has been associated with employee stress and wellbeing. Coaching has also been shown to improve individual level measures of wellbeing. However, almost all the research into the effectiveness of coaching interventions assumes a linear model of change, and expects that any flow-on effects are also linear. In other words, much of the research assumed that any change in the leader has relatively uniform effects on the wellbeing of others, and that these effects can be adequately accessed via standard linear statistical analyses. We argue that linear approaches do not take the complexity of organisations seriously, and that Complex Adaptive Systems theory (CAS) provides a useful non-linear approach to thinking about organisational change and the wellbeing of individuals embedded in these systems. The relatively new methodology of Social Network Analysis (SNA) provides researchers with analytic tools designed to access the relational components of complex systems. This paper reports on changes observed in the relational networks of an organisation following a leadership coaching intervention. An AB design coaching intervention study was conducted across an organisation (N = 225). Wellbeing measures were taken for all employees and a social network analysis was conducted on the degree and quality of all organisational interactions. Twenty leaders (n = 20) received 8 coaching sessions. Individual self report measures of goal attainment as well as 360 feedbacks on transformational leadership were assessed in the control, pre and post intervention periods. A significant increase in the goal attainment, transformational leadership and psychological wellbeing measures were observed for those who received coaching. Average change in the perceived quality of interaction improved for those who received coaching. However there was a decline in the perceived quality of the interaction others believed they were having with those who were coached. It was also found that the closer any member of the network was identified as being connected to those who received coaching, the more likely they were to experience positive increases in wellbeing. This research highlights the influence of leadership coaching beyond the individual leader, and has important implications for organisational wellbeing initiatives and how we measure the impact of interventions aimed at organisational change. Our findings suggest a more nuanced approach is needed in designing interventions in complex adaptive systems. Coaching psychology is an established and increasingly popular change methodology in organisations (Grant et al. 2010b). Research on coaching at the individual level has been related to: increased goal striving, hope and wellbeing (Green et al. 2006); increases in goal commitment, attainment and environmental mastery (Spence and Grant 2007); increases in cognitive hardiness, mental health and hope (Green et al. 2007); the reduction of workplace stress and anxiety (Gyllensten and Palmer 2005); improvements in transformational leadership (Grant et al. 2010a; Cerni et al. 2010); and the enhancement of outcome expectancies and self-efficacy (Evers et al. 2006). While the published research tends to focus heavily on individual level outcomes, the importance of coaching for groups and teams has been asserted previously (Arakawa and Greenberg 2007). Despite these assertions, the impact of coaching at the level of the group, team, organisation or system has largely been ignored. The limited research that does exist in this area has focused mostly on return for investment (Feggetter 2007; McGovern et al. 2001; Palmer 2003). The impact of coaching for leadership development on broader organisational measures such as collaboration, communication flow, relationships and the wellbeing of others in a system, has been left empirically untested. If the wellbeing of organisational members is of any importance, this focus must shift. Focusing on the broader organisational impacts of coaching may provide a deeper understanding of coaching, at both the individual and organisational levels, and give greater clarity on the role of coaching in the process of effective organisational change. Complex Adaptive Systems theory (CAS) is a promising approach to understanding organisational level dynamics, behaviour and outcomes. CAS theory describes organisations as diverse networks of interacting systems that grow and adapt in response to change in the internal and external environment (Eidelson 1997). According to CAS theory, systems adapt in novel ways. System components interact, creating feedback and feed forward loops which in turn further affect ongoing behaviour and the trajectory of change (Cavanagh 2006). The recursive and iterative structure of these loops means that change is usually non-linear. This non-linearity renders prediction difficult and limits the utility of linear statistical approaches (Cavanagh and Lane 2012). From a CAS perspective, the networks of communication and relationships that exist between individuals become the dynamic connections that shape organisational subsystems giving rise to organisational behaviour. By focusing more directly on this interconnectivity (i.e., the pattern, absence and quality of these connections), CAS theory may help us to better understand the potential drivers of emergent organisational change. Leaders are active influential agents in organisations. It has been suggested that Leadership is concerned not only with the direct influence of the leader on subordinates, but also with the indirect influence that leadership exerts throughout and around the system at large (Osborn et al. 2002). As change in a system occurs, leaders and other agents adjust to new information. As agents in a system expand (or contract) their behavioural repertoires, the behavioural repertoire of the system as a whole expands or contracts (Kauffman 1993). Coaching is designed to change the individual leader and the way in which that leader interacts with the system. As system members adapt to these changes, the system itself is altered. The key data of interest, from a CAS perspective, are the nature of the interactions between the system members. These data are essentially relational. They exist between individuals rather than being embedded in a given individual. One way of assessing the influence of coaching on an organisation is to assess changes in the way members of an organisation are connected and interact, i.e. changes in the pattern and quality of their communication. However accessing and analysing relational data presents significant difficulties. Interaction research has been plagued with a heavy commitment to a laboratory-based experimental methodology in order to control for confounding factors. However, in doing so, laboratory studies limit the real life application of their findings (McGrath 1997; Moreland et al. 1994). Consistent with a call for a new and more complex research framework (Frey 1994; Fuhriman and Burlingame 1994; Moreland et al. 1994), McGrath (1997) suggests that group research needs to occur in more realistic settings, thus allowing the group to function as complex, adaptive, dynamic systems. One research project that sought to take up this challenge was conducted by Losada and Heaphy (2004). They filmed groups of executives during their yearly strategic planning meetings, coding their interactions over time on a range of dimensions (Losada and Heaphy 2004). These dimensions were: (1) the ratio of positivity to negativity, (2) the ratio of advocacy to enquiry and (3) the ratio other-focus to self-focus in the verbal utterances of team members. These dimensions were drawn from the work of previous researchers such as Bales (1950): Bales and Cohen (1979), Gottman (1981); Gottman et al. (1977), Argyris and Schon (1978), Hax and Majluf (1991), and Buber (1970, as cited in Losada and Heaphy 2004). Losada’s particular contribution lay in the development of mathematical algorithms aimed at assessing the dynamic nature of these interactions across time (Losada 1999). Losada’s algorithms highlighted the importance of connectivity. Connectivity can be thought of as the influence members have on each other, as measured by recurrent patterns of behaviour over time. It was found that connectivity was strongly associated with team performance (Losada and Heaphy 2004). Losada (1999) realised that the mathematical formula he developed to match the time series data he had witnessed through team observation, was the same set of differential equations used by Lorenz (1963; Strogatz 2001) to understand change in the complex adaptive system of weather. The Lorenz equations have greatly assisted in the examination of how complex systems evolve over time, helping to predict the behaviour of many different types of complex systems based on change in key variables (Thompson and Stewart 1986). Applying these equations to group interaction research has been a promising step forward considering groups as CAS. Losada later developed the Meta-Learning model (Losada and Heaphy, 2004). This model mathematically related ratios of Advocacy/Inquiry, Other/Self and Positivity/Negativity to Connectivity and the performance of business teams (Losada and Heaphy, 2004). It was found that the most important ratio to consider was that of positivity to negativity and that, on average, a ratio of approximately 5 to 1 of positivity over negativity was indicative of high performing teams. The research of Losada and his colleagues is particularly important for two reasons. Firstly, alongside Gottman and Levenson (1992) they are among the first to apply non-linear methods to assessing group dynamics. Secondly, this research formalises the mathematical link between basic positivity to negativity ratios and the previous time series data using the Lorenz equations (Losada 1999). Losada’s model and supporting data suggest that simple and easily obtainable measures of positivity and negativity could be used to predict patterns of performance in senior leadership teams. At the dyad level, Gottman has shown that Positivity to Negativity (P/N) ratios could be used to discriminate distressed from non-distressed couples (Gottman et al. 1977), and that low P/N ratios predicted a significantly greater risk for marital dissolution and lower marital satisfaction (Gottman and Levenson 1992). More recently, Fredrickson and Losada (2005), used the mathematical formula from the meta-learning model to predict levels of positivity to negativity in individuals characterised with flourishing mental health. Waugh and Fredrickson (2006) have also found that a similar threshold of P/N can determine those who are able to reach a complex understanding of others from those who cannot. P/N ratios of between about 3:1 and 8:1 tend to represent flourishing in different forms, at the individual level (Fredrickson and Losada 2005; Waugh and Fredrickson 2006), at the dyadic level (Gottman and Levenson 1992) and at the team or group level (Losada and Heaphy 2004). It would seem a logical next step to consider how P/N ratios may be important at the organisational level. If P/N ratio of interactions in organisations is related to individual experience, we may find that the distributed pattern of experiences in an organisation can relate to measures such as organisational climate, commitment and collaboration. The pattern of positivity and negativity that characterises the communications within an organisation may also have significant influence over the experience of individuals on factors such as wellbeing, engagement and satisfaction (Harter et al. 2003). Analysing the impact of coaching on the quality of communication at the organisational level, may help us to understand the mechanism by which leaders are able to influence the way systems are experienced, organised and interact. While it is likely that leaders influence the quality of communication and relationships between individuals, to date, analysis of relational data such as interactions, communication and relationship quality, has been left untested in coaching research. Social Network Analysis (SNA) is a relatively new technique, primarily concerned with understanding networks and the way in which the network members are related (Scott 2000). It has been applied in a wide variety of fields including management, anthropology, political science and psychology (Hatala 2006). However, a lack of empirical research on leadership and social networks has been noted (Brass et al. 2004). SNA takes into account the interconnectivity observed between members. Relational data consists of things such as contacts, ties, information flow, influence and communication between individual agents (i.e., network members, or “components of a system” to use Scott’s terminology). These relations do not belong to the individual agents but are part of the relational system between system agents, or system components (Scott 2000). SNA is a technique that allows researchers to focus, at a systems level, on the relational data in networks. In doing so, it allows research questions to focus on emergent properties and interconnectivity of a system (Scott 2000). Hence it has potential to yield a more ecologically valid analysis than more common linear approaches used in leadership research. Balkundi and Kilduff (2006) outline the potential for SNA in investigating leadership and highlight three networks of interest: (a) the direct ties surrounding leaders, (b) the pattern of direct and indirect ties embedding the leader in the organisation or system and (c) the inter-organisational linkages formed between leaders across organisations. SNA has been used to investigate group performance and leader reputation (Mehra et al. 2006a), leadership distribution in teams (Mehra et al. 2006b) transformational leadership, group interaction and organisational climate (Zohar and Tenne-Gazit 2008), advice and influence networks of transformational leaders (Bono and Anderson 2005), and social capital in relation to intra-firm networks (Tsai and Ghoshal 1998). However, these studies have been cross-sectional. The authors are unaware of any SNA research that has focused on changes in groups, teams or organisations following an intervention designed to improve patterns of interactions and communication. If we are to understand organisations as CAS with non-linear emergent properties, research that measures change over time is required. Leadership coaching is typically conducted at the individual level. It is concerned with supporting changes in leaders that enhance the effectiveness of the organisation and the relationships that comprise the organisation. Hence, this study seeks to understand the impact of coaching at several levels - individual, relational and organisational. As such, this study represents the first of its kind in the field. Following Balkundi and Kilduff’s (2005) call to action, analyzing not only the network of communication ties that directly surround and embed leaders in a system, but also the quality (positivity / negativity) of these connections represents an important extension of SNA research on leadership and organisational change. By analyzing these data both pre and post leadership coaching, an understanding of the effectiveness of coaching in creating broader organisational change, may emerge. Hypotheses on individual, relational and systemic level impact of developmental coaching of leaders. Hypothesis 1: A Significant positive increase will be observed in measures of wellbeing at the conclusion of the intervention period for those receiving coaching. Hypothesis 2: A Significant positive increase will be observed in goal attainment measures at the conclusion of the intervention period for those receiving coaching. Hypothesis 3: A Significant positive increase will be observed in360 feedback measures of Transformational leadership at the conclusion of the intervention period for those receiving coaching. Relation dimension - Theories of transformational leadership suggest that leaders higher in transformational leadership, are better able to build trust, act with integrity, inspire others, encourage innovative thinking, and help others to develop for themselves (Avolio et al. 1995). These five features of transformational leadership are all relational in some way. If transformational leadership qualities are observed to be changing in an individual, then this change in experience of the leaders must be transmitted somehow to those with whom they are connected. This transmission may occur through the quality of interaction that these leaders have with those around them. For the purpose of this study, there are two measures of change in the quality of interactions that may access this hypothesised change in dynamics. The first is the coached leader’s perception of the quality of interactions between themselves and others. In social networking analysis this perception is thought of as an outward directed relation (Communication Out). It is derived from the ratings a target individual (the coached leader) gives to their relations with others in the system (Freeman 2004). The second measure of change in the quality of system interactions is comprised of ratings made by system members of the quality of interactions they have with a target individual (e.g. the coached leaders) (Freeman 2004). This metric is thought of as an inward directed relation (Communication In). Communication Out and Communication In may be, but are not necessarily equal. It is possible that undergoing individual leadership development may change how a person perceives their relations with others independent of any measurable or noticeable change in behaviour. If actual behaviour is not changed, it is unlikely the individual receiving development would be experienced by others as different. If no change in the leaders was experience by others, it is unlikely that these others would then undergo any individual level change themselves as a result of the development of the leaders with whom they are connected. In other words, in the absence of behaviour change in the coached leaders, the wellbeing of others in the system and any system level measures are likely to remain unchanged. However, if coached individuals are experienced as improved on measures of transformational leadership (e.g. trust, inspiration etc. ), transformational leadership theory predicts an increase in psychological wellbeing among others in the system (Nielsen et al. 2008). Trust in the relational context has been shown to play a pivotal role in relation to wellbeing, health and life satisfaction (Helliwell and Wang 2011; Helliwell and Putnam 2004). From a network perspective, it would follow that those most connected to leaders with improved levels of transformational leadership would be most likely to experience change in wellbeing. Hypothesis 4: There will be a positive increase in Coached participants’ mean perception of the quality of their communication (Communication Out), compared to non-coached participants following the coaching intervention. Hypothesis 5: There will be a positive increase in participants’ perception of the mean quality of their communication with coached individuals (Communication In), compared to non-coached individuals following the coaching intervention. If hypothesis 4 and hypothesis 5 are supported, an improvement in the wellbeing of those most closely connected to the coached individuals may be observed, as these closely connected individuals would be most exposed to positive relation change with the leaders across the system. Individuals also have multiple connections across complex systems, only some of which are to those receiving coaching. If one’s experience of the system is related to their place within the structure and architecture of the network as a whole, then it is important to take into account all their connections and not just those with targeted individuals such as the coached leaders. For example, consider the case of Peter. Peter is directly connected to Meg, a recipient of coaching, who following coaching, has positively changed how she interacts with others. These others, in turn, have positively changed the quality of their interactions with others. If we assume that Peter would observe at least some of these changes, Peter might begin to experience the work place differently, even though he himself had not been coached. However, we also need to take into consideration the number of people to whom Peter is also connected who have shown no change, or even negative change in their interactions. The experience of these connections may serve to inhibit any positive shift in Peter’s experience of the workplace. Hence, it is important to consider the full range of Peter’s experience of interaction in the organisation. By measuring individual change in relation to organisational level interconnectivity, this approach seeks to account for the interconnected context in which an individual is embedded. In networked organisations, an individual may be connected to a number of coaching recipients. If the coaching is effective, such an individual is likely to experience a proportionally larger degree of change in their experience of the system than someone connected to only one coaching recipient, or only indirectly connected to a coaching recipient. It is plausible that the greater weight of positivity may lead to a comparatively greater shift in the individual’s experience of the organisation, and comparably greater increases in wellbeing and positive organisational indices such as collaboration, engagement and work place satisfaction. The multiplicity of connections between people, and the large degree of variation in network positioning, present challenges to assessing interconnectivity in large, complex, interconnected systems. To overcome this challenge SNA provides a number of metrics of interconnectivity. One group of such metrics involves the notion of Centrality. Centrality measures different ways in which a person may be embedded in a network. For our purposes two types of centrality are important. Closeness Centrality: this is a measure of the degree to which an individual lies a short distance from most other individuals (Scott 2000). Unfortunately, no analytical techniques currently exist, that enable analysis of changes in centrality in specific sub groups comparative to an entire network. Therefore, the ability to assess network level changes that may be occurring locally to only those that have received coaching is limited. One way to overcome this limitation is to create a sub network or network neighbourhood (Hanneman and Riddle 2005) which only includes those connected to at least one coached individual and the connections that these individuals have with each other. Comparisons can then be made between the centrality measures observed in both the whole network and the coached neighbourhood network, and their relation to change in any of the individual level variables. This means that a stronger relationship between measures of individual level wellbeing and measures of centrality should be observed in the coached neighbourhood network, compared to the whole network for the intervention period. Such an observation would provide supporting evidence for a coaching ripple effect. Hypothesis 6: The relationship between measures of change in wellbeing and centrality in the quality of interactions within the coached neighbourhood network will be stronger than those observed in the primary or whole network. Organisational level impacts - The coaching ripple effect would also suggest that if positive change in the quality of communication occurs in key sub networks across the system to a great enough degree, other system level measures may also be observed to change. Specifically, one would expect a positive change in the density of the positive interactions in the system as a whole. For valued and directed networks, network density is defined as the sum of the value of all ties present, divided by the number of possible ties. Consequently, in this study, density is the ratio of the number and strength of all present ties that each individual has in a network, to the theoretical maximum number and strength of all possible ties (Hanneman and Riddle 2005). Density is a measure of the degree of total interconnectivity of the system as a whole. If the positivity of communication across the network is improved to a great enough degree, the density of the quality of the interaction network should improve over the intervention period. Hypothesis 7: A positive increase will be observed in the density of the quality of interaction network post intervention period. By considering the potential impact of leadership coaching and change in the leader, beyond the leader themselves. Participants were academic and general staff invited from an academic organisational network (n = 225) to participate in the research. The responsibilities of the network included research, teaching, faculty administration and the provision of paid clinical services to the general public. The clinical service provision is run similarly to a private enterprise. Network members worked from two geographically dispersed locations. The organisation’s structure is team based with hierarchical reporting requirements. While most individual members have a great deal of autonomy, a large degree of collaboration and interaction across units and teams is required in order for the day to day function of most roles and responsibilities. Participants were in two distinct categories, those who received coaching (n = 20) and all others in the network. All mid-level and senior leadership positions (38) across the organisation were offered to participate in the coaching process. Twenty two chose to participate. Two dropped out after the first week of coaching leaving n = 20 individuals who received coaching. 30% of those who received coaching were female, mean age was 45.3 and average tenure was 9.7 years. Out of all other individuals in the network, not all network members chose to participate with n = 102 participants completing all data across all time points. 55% percent of all participants were female. The mean age was 43.02 with an average tenure of 8.78 years. Data on all members of the network (N = 225) were used for the majority of the social network analysis processes, as all perceived relationships with others, regardless of participation, are important for analysing a participant’s experience. A repeated measures control period AB design was employed. Participants in the coaching condition received eight sessions of one to one coaching over a 16–20 week period. All participants were measured at three time points: a baseline control measure, again approximately 18 weeks later prior to commencement of the coaching intervention, and post coaching intervention approximately 20 weeks later. This design provided a comparative time frame for the control period and post coaching intervention. The Psychological Well-Being Scale (PWB; Ryff and Keyes 1995) was used to measure the wellbeing of all participants. Goal Attainment Scaling (GAS; Spence 2007) was used to measure the degree to which coached individuals moved towards their goals. Transformational Leadership was measured using 360 degree feedback through the Multifactor Leadership Questionnaire (MLQ; Avolio et al. 1995). A social network analysis was conducted at all three time points in order to measure the quality and pattern of interaction across the organisation. Whole-network data was collected, using the roster method (Scott 2000; Wellman and Berkowitz 1988). Respondents were provided with alphabetical lists, grouped by formal teams, of the names of all organisation members. They were required to assess the frequency that they communicate with each person on work related matters, on a regular basis (Scott 2000), and the level of positivity and negativity of these interactions using a five point likert scales. A positivity to negativity ratio was created out of the two interaction quality scales, providing a valued directed network of the quality of interactions across the organisation. Only relationships rated with a degree of interaction 3 and above, (moderate to very high) on the frequency Likert scale were included in creating the network. UCINET (Borgatti et al. 2002) was used to create and run the network analysis for measures of Density, Closeness Centrality and to run network based statistical analyses. UCINET is a software package designed to manage, investigate and analyse the relations within a social network. UCINET is used to analyse relational network data, similarly to how SPSS is used to run analysis on attribute based data. Eight coaches were used to administer the coaching intervention. Coaches were paid for all coaching session as part of the research funding. Coaching was provided gratis to the coached participants and the organisation. Coaching consisted of developmental and cognitive behavioural approaches. All coaches had completed a minimum of a Master’s degree in coaching psychology and had at least 3 years of experience as practicing coaches. Coaches worked with the Coachees to establish clear self-directed goals around improving the quality of interactions in themselves and the workplace. The goals could represent anything in the workplace as long as it could be related in some way to quality of interaction. Participants received 8 coaching sessions over the course of the intervention. Times and locations of coaching sessions were arranged between the coach and coachee, within the allotted intervention time frame in order to minimize coordination issues. Cognitive behavioural and developmental approaches to coaching were chosen as they are well suited to assisting clients with (i) identifying and specifying the desired quality of relationships in the client’s context, (ii) the self-regulation of cognitive processes important for interpersonal communication and (iii) the development and regulation of behavioural repertoires and multiple perspectives involved in interpersonal communication. Group Supervision was provided to support all coaches during their coaching engagements. This process encouraged shared experience and learning across the coaches. A mixed between-within subjects analysis of variance was conducted to assess impact of coaching on participants’ scores of wellbeing across the three time points (Baseline, Pre and Post intervention) for both those that received coaching directly and all others in the system. The means and standard deviations are presented in Table 1. There was no significant interaction between group and time, Wilks’ Lambda = .974, F(2, 99) = 1.3, p = .28, partial eta squared = .026. There was a moderate main effect for time, Wilks’ Lambda = .906, F(2, 99) = 5.11, p < .01, partial eta squared = .094, with coached individuals showing an increase in wellbeing over the intervention period (see Table 1). The main effect comparing those directly coached with all other participants was significant, F(2, 99) = 4.019, p < .05, partial eta squared = .039. This significant finding suggests that those who were coached had increased levels of wellbeing over the intervention period, compared to those that did not receive coaching. These results support Hypothesis 1. Goal attainment measures were taken pre and post intervention only. A paired-samples t-test was conducted evaluating coaching impact on goal progress. Supporting hypothesis 2, significant increase in goal attainment scales from pre-intervention (M = 4.21, SD = 2.07) to post-intervention (M = 7.05, SD = 1.35), t(19) = 8.16, p < .0005 were observed. The mean increase in goal attainment scores was 2.83 with a 95% confidence interval ranging from 2.11 to 3.56. The eta squared statistic (.78) indicated a large effect size. A one-way repeated measures analysis of variance was conducted to compare scores on perceptions of transformational leadership (360) of those that received coaching across the three time periods. In total, 59 people provided feedback on 20 leaders across all time points eliminating the need to average, for each coached leader, the scores across feedback. This approach provided a larger sample size strengthening the statistical analysis. The means and standard deviations for transformational leadership scores are presented in Table 2. There was a significant large effect for time Wilks’ Lambda = .86, F(2, 57) = 4.44, p < .02, multivariate partial eta squared = .135 with significant change occurring over the intervention period (p < .02) supporting Hypothesis 3. The perceived quality of communication was analysed in two directions. The perceptions participants had of the quality of their interaction with others, referred to as Communication Out, and the perception others had of the quality of the interaction with the participants, or Communication In. The data were split into two groups coached and non-coached. Change score were calculated for the control period (Pre-Coaching – Baseline) and the Intervention Period (Post-Coaching – Pre-Coaching) In order to assess any change that may have occurred due to the coaching intervention and any differences between those coached directly and others in the network. T-tests were conducted to compare the differences between the coached and non-coached network members on change in the quality of interactions, for both Communication In and Communication Out. Given that participants are all members of the same network and the data of interest here are relational, individual measures of connectivity are therefore interdependent. Similarly to other studies of full networks (Fliaster and Schloderer 2010) it is assumed that observations of relational data within the same network are not independent leading to biases of ordinary-lest-squared (OLS) tests of significance (Krackhardt 1988). Instead of ordinary OLS tests, T-tests were conducted within UCINET (Borgatti et al. 2002) using a bootstrapping method which estimate sampling variance by randomly reordering the network connections thousands of times, providing confidence intervals to determine whether any difference observed is largely due to chance. This confidence interval was then used to test the significance of the differences. The means and standard deviations across the control and intervention periods are presented in Table 3 for Communication In and Table 4 for Communication Out. There were no significant difference in mean change in quality of communication between the coached (Communication In: M = −.024, SD = .378; Communication Out: M = .037, SD = .720) and non-coached (Communication In: M = .004, SD = .551; Communication Out; M = −.010, SD = .521), Over the control period (Pre-intervention – Coaching). There were statistically significant differences in mean change in quality of communications between the coached (Communication In: M = .226, SD = .367; Communication Out: M = .196, SD = .308) and non-coached (Communication In: M = −.033, SD = .561; Communication Out: M = −.062, SD = .618) over the intervention period. Significances values for Communication In were p < .02 and for Communication Out p < .01 (One-tailed). These results partially support hypothesis 4 and 5 in that significant differences were only seen in the intervention period however the direction of the change was mixed. In order to assess the impact of connectivity of individuals to those that received coaching on individual levels of wellbeing, closeness centrality measures were calculated for all participants at the baseline and pre-intervention time points. Closeness centrality was calculated for individuals in the entire network and again in the coached neighbourhood network. Relationships between Closeness centrality, in both the entire network and the coached neighbourhood network, and change in wellbeing over the control period and the intervention period were calculated using Pearson product–moment correlation coefficient. All correlations are presented in Table 5. *p < .05, **p < .01, ***p < .001 (2-tailed). There were no significant correlations with change in wellbeing during the control period in either the entire network (n = 116) for In Closeness (r = −.039, p = .680) or Out Closeness (r = −.039, p = .681), or the Coached neighbourhood network for In Closeness ( r = .136, p = .173), or Out Closeness (r = −.143, p = .152). A negative relationship was observed for Out Closeness centrality and change in wellbeing over the intervention period across the entire network (r = −.253, p < .01). A similar relationship was observed for Out Closeness in the coached neighbourhood network (r = −.206, p < .05). A positive correlation was observed between In Closeness centrality and change in wellbeing for the coached neighbourhood network (r = −.223 p < .05). Higher levels of In Closeness in the coached neighbourhood network related to higher levels of positive change in wellbeing during the intervention period partially supporting hypothesis 6. Figure 1 presents the graphical output of Netdraw (Borgatti 2002). Netdraw visually presents the quality of interaction relationships between individuals across the organisation using data drawn from the UCINET network analysis. Figure 1 represents change in wellbeing, over the intervention period for all participants in the coachee neighbourhood network. Quality of interaction and change in wellbeing in the coached neighbourhood network post coaching intervention. Measures of Psychological Wellbeing and a social network analysis of the quality of interaction were conducted across 225 members of an organisation. 20 individuals received eight, one to one coaching sessions over a 16 to 20 week period. The social network graph includes all organisation members who had a least one direct connection with an individual who had received coaching. The yellow diamond shapes represent those who were coached and the blue circles represent others in the organisation. The red lines are interactions in which the quality was rated below 3:1 positivity over negativity. The blue lines represent interactions rated 3:1 and above this threshold. The relative size of the circles and diamonds represents increase in psychological wellbeing that occurred over the intervention period. 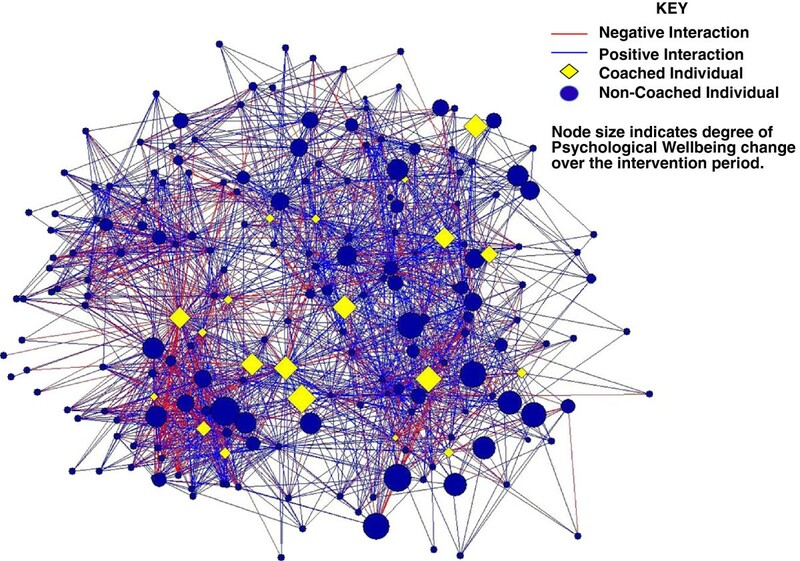 This figure shows that those observed to have increased their psychological wellbeing the most over the intervention period tend to be most closely connected to those that received coaching as measured through closeness centrality in the coachee neighbourhood network. In order to assess the impact of the coaching intervention at the organisational level, density measures of the quality of interaction network were taken across the 3 time point. Bootstrap methods using UCINET were employed in order to mitigate the violation of the assumption of independence (Kenny & Judd 1986). 5000 random sub samples of the network were made and levels of significance were assessed based on observed differences. Only participants that completed data for all three time points were included (N = 94). There were no significant differences observed in the density of the quality of communication network over the three time periods. Hypothesis 7 was not supported. The difference between densities for the control period was -.022, p = .80. The difference between densities over the intervention period was .009, p = .91. Densities and standard Deviations are presented in Table 6. At the individual level Hypotheses 1, 2 and 3 were supported. Those that received coaching showed significantly improved scores on psychological wellbeing measures. They felt they had significantly progressed toward attaining their nominated workplace goals, and were observed by others to have increased their transformational leadership behaviours. These finding provide evidence that at the individual level, the developmental coaching process was beneficial to both the felt and observed experience of those coached. The results support previous coaching research in establishing an empirical link between coaching and increases in psychological wellbeing and goal attainment (Linley et al. 2010; Green et al. 2006; Spence and Grant 2007), while also extending the limited and recent experimental evidence supporting the relationship between coaching and improvement in transformational leadership measures (Grant et al. 2010a; Cerni et al. 2010). It is important to note that the improvements in transformational leadership were identified by others and not via self-report. This observation suggests that changes in the leader’s interactions following coaching did have an impact on the way the leader was perceived. As expected, no significant difference was seen in any change in quality of communication between the coached and non-coached individuals during the initial control period. However, during the intervention period, those that received coaching rated their Communication Out, on average, to have improved. That is, the coached individuals saw the quality of their communications with others as more positive. This was significantly different to changes in Communication Out of those that did not receive coaching. Given that support was also found for Hypothesis 3 (that others observed greater levels of transformational leadership in those who were coached), it seems probable that the quality of interactions between coached individuals and others did change. However, this change in communication quality was not always experienced as positive by those around the coached individual. The average quality of interaction, as rated by others (Communication In) was significantly less positive for those who were coached, compared to those who were not coached. This pattern of results was not expected and presents some conundrums. While the Coaching intervention did appear to improve the quality of communication from the coachee’s perspective, it was perceived by those around the coachee to have become less positive. There appears to be a clear difference between how those coached experience their interactions towards others, and how those others experience these interactions. At the same time, those coached were rated by a sample of these same others as having improved on transformational leadership measures. One explanation for this pattern of findings is that the coaching process encourages the coached individual to try new ways of interacting to address the difficult issues facing them and their colleagues. In other words, the coachee is involved in, and being supported through, an intentional and deliberate process of change aimed at assisting them in dealing with difficult and challenging issues. Any changes made are therefore more likely to be experienced by the coachee as movement forward and improvements on previous patterns of communication, and judged more positively. A very different experience may occur for those on the other side of this new communication. The new pattern of interaction may be experienced as an unexpected, and potentially unwanted, change in the normal functioning of the relationship. Changes in communication can be initially confusing and anxiety provoking, accounting for the lower perceived positivity of the interaction. In such situations people often turn toward third parties for support and understanding – a process known as triangulation (O’Neill 2000). This triangulated support might explain why, contrary to hypothesis 7, the overall density of the quality of interaction in the primary network remained stable. It is also possible that the decrement in perceived positivity of leader’s communication may be due to a lag effect in competency. In other words, a leader’s capacity to conduct new, more challenging conversations in an elegant and competent manner, might lag behind their initiative in commencing such conversations. Significant changes of style are rarely born fully formed. This lag effect may help to explain why others perceived the leader’s interactions as less positive, while at the same time they perceived the leader’s style to be more transformational. The unexpected pattern of findings in this study highlights a key assumption often made in assessing change – namely that positive development in an individual will be experienced similarly by others. The validity of this assumption is questionable for a range of reasons. Individuals often have different types of relationships with different people regardless of the frequency and general quality of the interaction. Furthermore, individuals respond differently to change and tension in a system (Stacey 1996). Change may be welcome by some and resisted by others. In order to avoid the complexity of creating a new form of an established relationship, the change may instead be resisted and could therefore be seen as increasingly negative. Further research is required in order to clearly establish an understanding of how an individual’s response to change may interact with key change variables. Future research should include a follow up retest to observe a potential lag time effect for both the improved execution of new skills and a lag time for others in the system to experience change in the interaction quality that those coached may be coming to terms with earlier. Interestingly, over the intervention period, change in wellbeing across the network was more strongly related to an individual’s closeness in the coached neighbourhood network, compared to the whole (or primary) network in support of hypothesis 6. Specifically, In Closeness centrality related positively to change in wellbeing, post intervention. In Closeness centrality is a measure of the degree of positivity in communication others perceive they have with a given individual in the coached neighbourhood network. This centrality measure is a proxy for the frequency and strength of positivity of interaction coached individuals feel they have with a given individual. Put more simply, if those coached rate their interaction with a given individual as strongly positive and that individual is connected to a greater number of coaches, then that individual would have a higher level of In Closeness centrality in the coached neighbourhood network, and are more likely to have experienced increases in wellbeing post the coaching intervention. It is important to note that the opposite is true when looking at Out Closeness. This measure again is a proxy for the strength and number of relationships individuals perceive they have with others. In the coached neighbourhood network, it is more likely that these perceived interaction relationships are more closely linked to those who received the coaching intervention. For those high in Out Closeness there was a negative correlation with change in wellbeing in both the primary network and the coached neighbourhood network. The strength of these correlations was also quite similar. It may be that Out Closeness across the two networks is similar because this measure is capturing individuals who feel they have many important communication relationships to manage. High Out Closeness in this sense indicates a propensity of an individual to highly value many relationships. Managing too many high quality relationships could actually be quite exhausting. As those who were coached change their approaches to interacting and the quality of their relationships with others in the system, their relationships with these individuals becomes more complex. This change may put further stress on an individual with high levels of relationship maintenance requirements (High Out Closeness). This relational load increase could explain the observed negative change in wellbeing for these individuals, in both the coached neighbourhood, and primary networks. Another feature of high Out Closeness is that there is often a discrepancy between the number of important relationships a person feels they have, and the number of important relationships others feel they actually have with them. This lack of reciprocity may be a key to the lowered degree of wellbeing in those with high degrees of Out Closeness. Even though individuals in the system perceived deterioration in the quality of their communication with those that received the developmental coaching intervention, the more positively and closely these individuals were identified by coached individuals, the more likely they were to experience positive changes in their psychological wellbeing. This finding suggests that the positivity leaders perceive in their interaction with other individuals is more predictive of the positive change in wellbeing of these others, than how these individuals themselves rate the quality of their interaction with those leaders. Alternatively, this finding may again indicate a lag effect. Members of a system may need to get use to how the environment has changed before the change is consciously experienced as positive. Even so, there does seems to be an influence on the wellbeing of others following change in the organisation, that is at least initially independent of the recipient’s conscious perceptions of change. This interpretation of results would suggest that focusing on how leaders in a coaching intervention perceive the quality of their relationships with others, could have beneficial effects on the wellbeing of those to whom they are connected. Designing coaching interventions to specifically encourage leaders to notice and reflect on positive changes in relationships could have beneficial consequences for others in their local network. Future research could specifically construct coaching engagement to analyse this more closely. These findings suggest a number of other implications for how interventions may be designed within organisational context. For instance, when developing leaders, it is important to consider how to support the shift in perspectives, both positive and negative, for those who are connected to a given leader, or many leaders, within a system. A more integrative systems perspective, that is, one that sees organisational members as embedded in a complex relational network of interaction, can start to explain some of the resistance and push back often seen in organisational change programs. Rather than focusing on the individual level or the dyadic levels of leader to subordinate, leader to boss or leader to colleague, a systems perspective encourages coaches and organisational sponsors to consider what impact changes in one or more individuals may have on the range of people and systems with whom they are most connected. Importantly, a systems perspective would encourage system members to notice a range of emergent reactions to change, and develop locally sensitive responses to address those emergent reactions. Another common assumption that our findings put into relief, is the assumption that only positive experiences improve levels of wellbeing. Psychological wellbeing is much more than just happiness. Psychological wellbeing is about meaning and purpose (Stacey 2002). It may be that the challenge of shifting relations provides a reminder of the meaning attached to our organisational endeavours and relationships, and that this enhanced focus on meaning positively impacts wellbeing. Coaching engagements are largely concerned with effecting change at the individual level. Sometimes, broader team level impacts are of concern and often coaching can be loosely connected to organisational goals. What are not often encompassed in the coaching process is how change in an individual relates to changes in the system, and how these changes may affect the experience of others. Given that there does seem to be a varying degree of impact of someone coached on others dependant on how closely connected they are with the coached individuals, it would seem that broader level impacts, outside of the individual, are important to consider. Another important question for organisational coaching practice raised by our findings is the questions of who should be coached? Our findings suggest that, when impact beyond the individual is important, then embeddedness in the network may help to determine who is best to receive coaching support. It would seem from these results, that if it is the wellbeing of the organisational members at large that is of organisational concern, then considering the network structure, architecture, and embedded position of potential coaching candidates, could be important. Considering structure and embeddedness, identifying the combination of individuals who would lead to the most influence through their connectivity in the network, might be the best way to gain maximum benefit for the wellbeing of everyone in the system. This approach could help organisational level interventions become more efficient, by maximising impact, and saving on valuable resources and intervention costs. There exists some support for the above position in related research. The diffusion of new behaviours and innovations has been thought to follow a general mechanism across a multitude of behaviours (Young 2002). It seems that the propensity for individuals within a network to change, increases with the proportion of adoption within a given reference group. Innovation adopters within organisational change contexts are often thought of as change champions. Willingness to support a change process within an organisation is thought to lead to higher adoption depending on the influence an individual has in the network (Backer and Rogers 1998). In human resources and organisational development identifying influencers or champions for change is often thought of as a useful approach to enhancing and supporting the effectiveness a change process. In word of mouth referral behaviour strong connectivity has been seen to positively support information flow (Brown and Reingen 1987). The adoption of new technology across an organisation has been shown to both occur through the network structure while also influencing the end state of the network structure (Burkhardt and Brass 1990). Studies have shown that adoption of innovations or change by individuals is influenced by the structure and quality of their social networks (Fennell and Warnecke 1988; Valente 1996; West et al. 1999). However, there is little empirical evidence supporting the identification and utilization of organisational champions to influence the adoption of a change process (Greenhalgh et al. 2004). One empirical study analysed change adoption in 40 units across a multinational organisation and found the interconnectivity at both the unit and leader levels were significant predictors of effective change implementation (Tenkasi and Chesmore 2003). While the research mentioned above is not directly related to the influence coaching may have on the wellbeing of others through the network of leader relationships. The current findings do support the idea that the greater the connectivity of a network the more likely change, in this case wellbeing, is to diffuse through a network. Finally, considering the broader level impacts of coaching is important specifically for evaluation and assessment purposes. It would seem that change in a leader may actually reduce the quality of how others experience the leader. It would seem important to consider how feedback and program evaluation are gathered as it may appear that initially things are getting worse post intervention. However, as observed here, there may be positive benefits gained through the change. Additionally limiting focus to the individual and dyadic levels of analysis may not allow for identification of the potentially beneficial changes that may occur at a more complex relational level or at the broader system level. Social Network Analysis is a relatively new and developing methodology. At present, the statistical processes available within SNA are limited. The on-going development of compatible statistical methods may enable a deeper understanding of the connectivity of each individual in a network to those who receive an intervention. However, despite the limited nature of the analyses available to us, a degree of evidence of coaching’s influence on wellbeing, more broadly across a system, has been found here. The purpose of this research was to examine specifically the idea that a “coaching ripple effect” might exist by which coaching leads to positive changes in wellbeing beyond an individual coached through the interconnectivity of a system. Future research may use a similar methodology to assess the impact of other intervention modalities, adding further empirical support to the social network analysis and diffusion literature. In this research only one network has been analysed and while there are many thousands of data points when considering changes in interaction, this pattern of findings may be a product of this particular system. Further research in different types of organisational networks is required to assess the generalisability of the patterns found here. Comparing groups of organisations in a waitlist control intervention design will also help to support these findings. Additional measures of group or organisational level performance would also add additional strength to the implications of coaching within complex interconnected organisations. Complex Adaptive Systems theory has been used in the current research as a framework for understanding the interconnectivity of a system at large and the potential for interconnected relationships and non-linear change. While the current analysis has not allowed for direct mathematical assessment of complexity and non-linear dynamics, future research allowing for this would significantly advance research on coaching in complex systems. Another issue is that whole network data was sought for the project. Unfortunately, not all organisational members participated across the three time points, resulting in missing data. While full network data is preferable in most network analyses, there were missing data from individuals across the time points in this sample. However, Costenbader and Valente (2003) have found that missing data is not such a critical issue when including the data collected from SNA respondents on everyone, including those who may not have responded, as was the case here. It has also been observed that centrality measures do express a degree of robustness under conditions of missing data (Borgatti et al. 2006). Traditionally, coaching engagements have been largely concerned with effecting change at the individual level. Social Network Analysis enables us to examine the impacts of coaching on the complexity of interactive relationships in organisations. The results of the current study suggest that the impacts of coaching beyond the individual are important for organisations to consider. At the individual level, coaching can improve wellbeing, goal attainment and transformational leadership behaviours. It was found that changes in the quality of interaction brought about through coaching may be experienced differently by other members of the system, depending on their relationship to those who were coached. Finally, the coaching ripple effect does seem to occur, and it seems to be the perceptions that coached individuals have of the quality of interaction they have with others, that influences this process. However, these relationships appear to be more complex than first thought. The patterns of perception between people are not always consistent, nor are they always predictive of wellbeing. However, some relationships do appear to be predictive. The more positively a coached individual rates their communication and their closeness with their people, the more likely they are themselves to be rated as a transformational leader, and the more their people are likely to experience improvements in psychological wellbeing. While there is much more to discover and while further analysis and experimentation is required, it would seem that an important step has been made in understanding the influence of coaching in an interconnected, organisational context. Furthermore, it would seem that the interconnectivity of the interaction network is important in understanding how the wellbeing of organisation members can be improved, directly and indirectly, through leadership coaching. Indeed, the quality of interactions that relate and connect organisational members may be the medium through which the coaching ripple effect propagates to become waves of positive change in wellbeing. SOC is a Leadership Development Coach, Lecturer and Researcher at the Sydney University’s Coaching Psychology Unit. SOC has a keen interest in social network analysis, systems theory, leadership development, coaching, and group dynamics. As part of his PhD (submitted in 2012), SOC received substantial support for this project through the Harnisch research scholarship at the Institute of Coaching. Sean has been intimately involved in the creation of the Handbook of Coaching through Standards Australia and has a passion for leadership coaching and organisational development and actively supports, coaches and consults to a large range of corporations and community projects. MC is both a Coaching and Clinical Psychologist. He holds a BA (Hons – 1st class) in Psychology from the University of Sydney, and a PhD and Masters of Clinical Psychology from Macquarie University. MC is currently the Deputy Director of the Coaching Psychology Unit at the University of Sydney. A registered psychologist, Michael has 20 years experience in facilitating personal, group and organisational change. He has designing and facilitated training and personal development workshops in Australia, New Zealand and the UK for a variety of public and private enterprises. MC is currently the coordinating editor of the International Coaching Psychology Review. This project was in part funded by a grant awarded under the Harnisch research scholarship from the Institute of Coaching, Maclean Hospital, Harvard Medical School. SOC Applied and received funding for the project and has been responsible for managing the funding. SOC designed, coordinated and project managed the research, collected and analysed all data and developed the draft of the manuscript. MC Provided input to the research design and funding application, contributed key ideas to interpretation of results, reviewed, contributed to and edited the manuscript and supervised much of the work of SOC. Both authors were responsible for supervision of the coaches and have read and approved the final manuscript.